MY SWEET ELIXIR: - Album Launch;- April 23rd @ The Cherry Tree venue, Walkinstown roundabout, Dublin 12. “All about me” is the first single from Fran King’s sophmore & eagerly awaited album, “My Sweet Elixir”. The album continues to recieve rave reviews since its U.S. release in December. 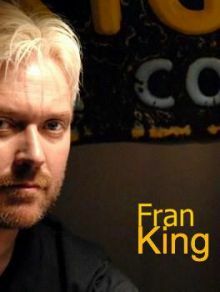 Although this is Fran’s second solo album, it’s his first for U.S. label Renaissance Records, to whom he signed in September 2009. The single highlights King’s vocal talents, “King has an absolutely wonderful voice that is sure to turn some heads ... listeners are sure to love the singing on this album and will find themselves returning to it frequently” wrote Chris Dahlberg of trendy U.S. website Comos Music. King’s solo debut album [Beautification, Head Space Records 2006] won him critical acclaim on both sides of the pond, and a loyal and growing fanbase in the American Mid-West. The track “Misunderstood” featured in the Movie “Tara Road” starring Andie McDowell. A glowing testament indeed to an album that not only sees Fran explore different genres, but also taking the Producers role for the first time.